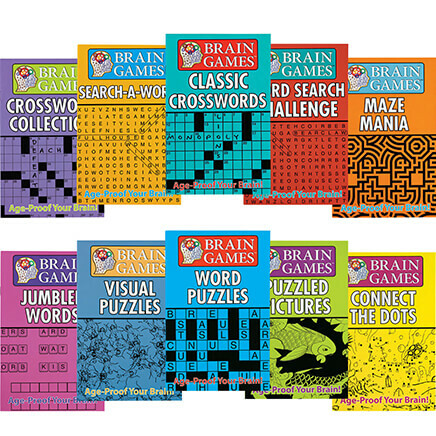 Add 2 Puzzle Mats to Cart, Get $2 Off each! 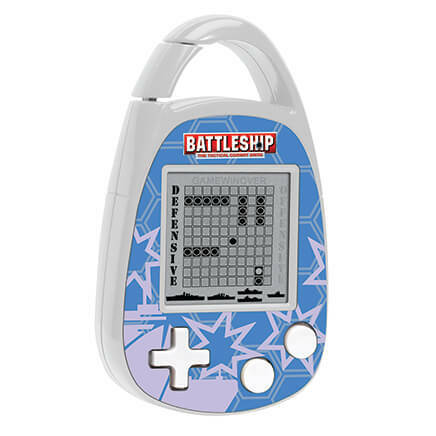 I received one of these as a gift and liked it so much that I wanted others to have a similarly good experience when being interrupted in their puzzle solving. I ordered this as a Christmas gift for my daughter-in- law as a Christmas gift. She is pleased with it as she was wanting one! My 2 grand-grandaughters LOVE to do puzzles. They are 6 and 4 and this is the PERFECT thing for them, especially when it's time to clean up and we're not done. I loved the fact that I could order that and have it shipped to their home and the rest come to my house and we live in different states. It was great! I was leery that my puzzle would hold together when I rolled it up but it seems to work just as intended. I ordered the larger size since it will accommodate all my puzzles. I wish the sorting trays would come back. HAVE A HANDICAPPED LADY THAT LOVES PUZZLES AND THIS PRODUCT HELPS KEEP THE PUZZLE IN PLACE SO SHE CAN COME BACK TO IT AT HER LEISURE. I bought this for my family. They love to put puzzles together. They use our dining room table and when it is time for dinner it just rolls up. Great to be able to roll the puzzle up and complete later. No more not using the table till the puzzle is done or never completing the puzzle because we need the table. It is great to make puzzles on. Just roll it up and unroll when ready to do your puzzle again. 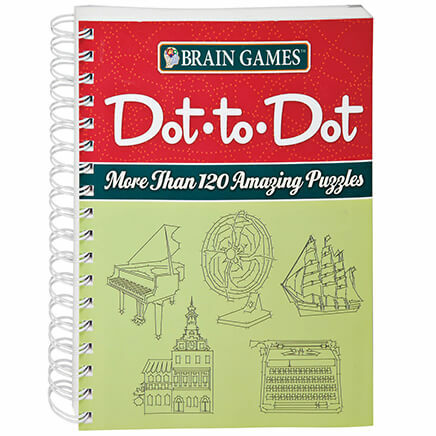 I bought this as a Christmas present for my son's girlfriend who loves to do puzzles. I think she will really love it. I plan to buy more of this product. I read the other reviews and some said it took some time to perfect. I only had to roll my puzzle once. It took me twice as long to get the puzzle off the ply board I have been using. I will be ordering more this winter. i have 4 cats, so making a puzzle was out of the question. i would awake in the morning to find puzzle pieces all over the floor and some pieces missing. with the jigsaw roll-up, i can pack up my puzzle each night when i am finished. The felt on the roll up keeps the puzzle pieces "stuck" to the fabric. You may always change the pieces of course, but when you roll it up, it stays on the fabric. I love it! :-) And as someone already wrote, this helps with patients that are bed ridden as in Hospice or just hospitalized for Occupational Therapy. Takes a bit of practice to use easily, but once done right, it is easy to do again. Works great to keep my cats from helping me when I'm not working on a puzzle. Jigsaw Roll Up - It's Not Puzzling! Very handy in the home of someone who is ill --- kids and other adults can do the puzzle while serious visits (as in hospice / paliative care) are being conducted. Wanted to do puzzles again, but with two cats that like to be where you are, pieces always ended up on the floor. Now the pieces stay in place and the cats don't play with the pieces. 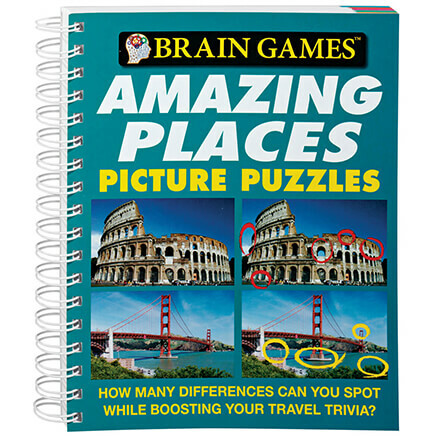 This is a great item for multi-use rooms because it allows one to pack up a puzzle before it is finished. Also, it does not take up much room when rolled up. I bought one for myself and one for a gift. Overall, I really like this product. I can't leave a jigsaw puzzle in progress lying around because of my cats. 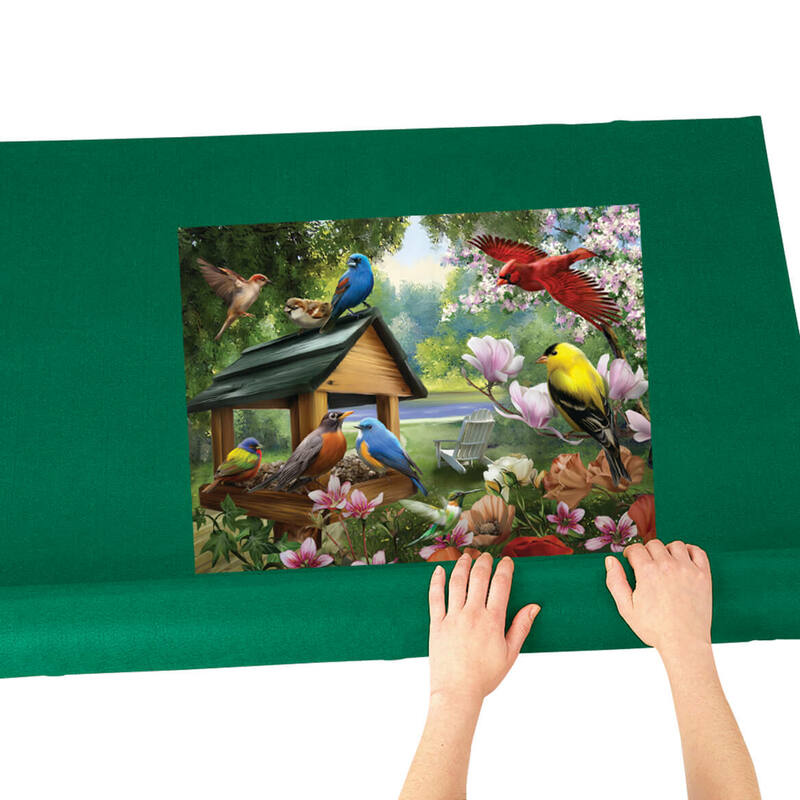 This jigsaw roll up helps keep pieces together and safe from the cats. I have found that if you have a big puzzle, the pieces tend to fall out when it gets rolled up. Also, the rubber bands are really hard to put on after the puzzle roll up is rolled up. Velcro would be a much better (and easier) way to secure the roll up for later use. I will be able to put a puzzle together with out worrying about losing pieces to it. I like the flexibility of rolling up the puzzle but found it sticks so well to the mat that it is difficult to move sections around. My puzzle was easier to start from the inside out so it wasn't easy to move the pieces to their right location within the framework once we got to that stage. Great way to keep a puzzle from being "in the way". It helps that my dining room table can be freed every day for dinner. I only wish that the bands were velcro straps instead of rubber bands. i love the roll up puzzle saver. I don't have to put it away, because it is time to eat on the table. have wanted one for a long time.definitely is handy. A great invention! Puzzle pieces don't fall on the floor. Keeps everything level. I use it to store individual pieces of a quilt block and also to separate 2- and 2 1/2-inch squares of fabric by color or value. I can spread them all out and roll them up and not have to re-sort them again the next time I want to find a certain color. It is just a piece of felt and 2 rubberbands. I expected, at least, velcro. I purchased it as a gift and will keep it for myself as it is not "nice" enough for a gift. I use it for puzzles. Luckily, I Igot it at a reduced price. Simple idea that I will be easily able to duplicate at 1/4 the cost. Much thinner than I expected,like a roll of felt. Putting together jigsaw puzzles and need to move before finished. The pieces stick to the fabric so sometimes it's hard to tell if the piece actually fits if it's close. I will be returning this. My son asked if it was a joke gift! I will have to buy a substansel material. More cost. Could not use slides off the tables tried several different ones. i like to put puzzles together and thought this would be nice to have. I have one and my kids really wanted one to protect huge puzzles in progress. It works great! Sometimes the table I'm using to work a puzzle is needed before the puzzle is completed. With this item I can quickly get the puzzle off the table and then go back to finish it after the other usage. My grandchildren and I work puzzles together and we need to be able to keep them put up. Great bargain, and good prices, especially with my ten dollar savings voucher! My sister is in need of this mat for her puzzles. I have done some puzzles in the past and bought some more, Kinkade puzzles, at Christmas. Since we have adopted another young cat, she is everywhere and has energy. So, I want to keep my pieces from being chewed and played with and not get lost. the price is good and I like doing puzzles and this will "simplify" things. Good idea but haven't used yet. 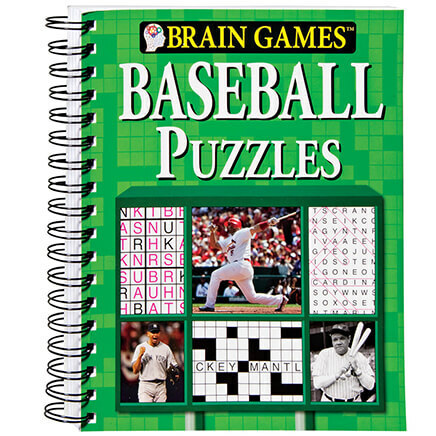 I am getting this for a grandson so he can roll up a puzzle until he gets back to it. Then it will be out of the way of the younger brothers. Needed to keep all the puzzle pieces together. I did not want to keep my table up all the time. Don't have a table big enough to leave puzzle out. Great for keeping puzzle pieces together and neat. trying out need a place to keep puzzle set up all the time. My daughter loves jigsaw puzzles and this is ideal for keeping the pieces where they belong. I do puzzles of 500 pieces. Wanted a manageable size, so chose the small size. The item looks convenient for traveling. have one and love it, want to give to son's family. puzzle for Christmas and only 1 dinner table. We need to be able to put it away when it is time to eat. Can't always keep it on the table. Regarding Jigsaw Rollup,what do they mean by "telescoping inner roll?" BEST ANSWER: Thank you for your question. 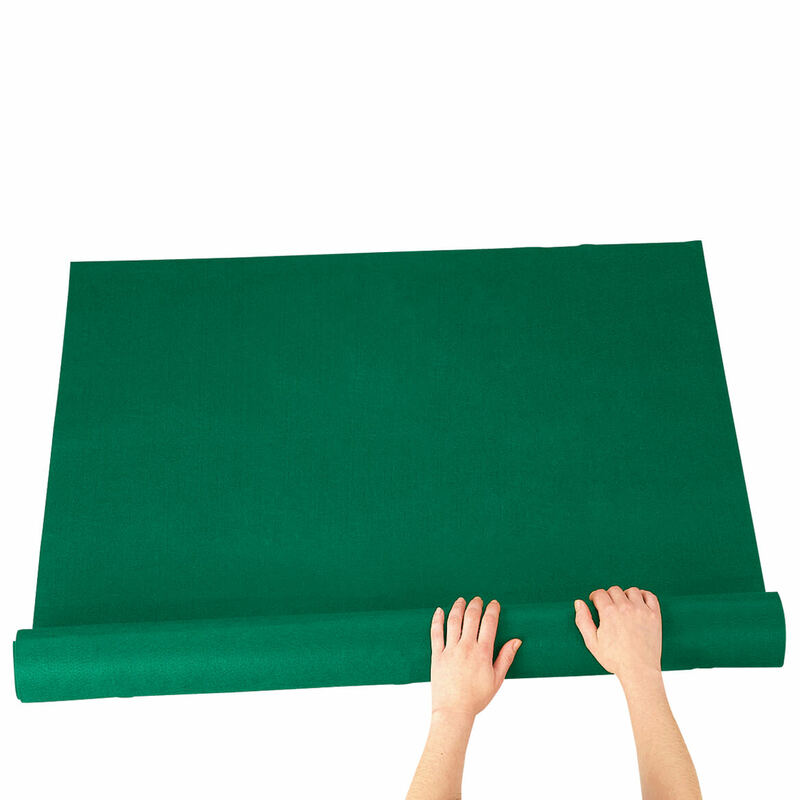 The telescoping inner roll helps to roll the item up for easy storage of puzzles. We hope this information will be of help to you. Can you do 1000 piece puzzles on the small size mat? BEST ANSWER: Thank you for your question. Depending on how large your puzzle is, the large roll-up measures 49 1/2" x 36" and the small roll-up measures 24" x 36". We hope this information will be of help to you.